According to the anonymous commentator on Plato’s Parmenides the One-being can (under certain conditions) be thought to participate in the first One above being (In Parm., XI-XII). The commentator offers two explanations of this fact, the first of which (In Parm., XI, 5-19) is closely reminiscent of the Peripatetic doctrine of essential predication. Accordingly, the structure of the second One can be equated to that of a species resulting from the composition of a genus (one) and a specific differentia (being / ousia). Several parallels connect this solution with the debates on Aristotle’s theory of predication attested in the Neoplatonic commentaries on the Categories. The parallels with Porphyry’s logical works are particularly valuable. Furthermore, in his Response to Porphyry, Iamblichus presents Porphyry’s account of the divine hierarchy as misleadingly implying that divine beings are species under the same common genus: a position which is virtually identical to that of the anonymous commentator, and finds no parallel in Neoplatonic authors other than Porphyry. This hitherto unnoticed parallel further suggests that Porphyry is the author of the anonymous commentary, as advanced by R. Chiaradonna, “Nota su partecipazione e atto d’essere nel neoplatonismo: l’anonimo Commento al Parmenide”, Studia graeco-arabica, 2 , pp. 87-97. Well before Philoponus’ attack against eternalism and Simplicius’ response, taking the form of a colossal commentary on Aristotle’s De Caelo, another thinker, the 4th century rhetorician and philosopher Themistius, had embarked upon a running exegesis of the this Aristotelian work. Themistius still had at his disposal the commentary on the De Caelo penned by Alexander of Aphrodisias, lost to us. Notwithstanding its importance, Themistius’ paraphrase of the De Caelo is poorly known: the Greek text is lost; a medieval Hebrew translation made on the basis of a lost Arabic one survives, together with a Latin translation of the Hebrew text, made during the Renaissance. From this unpromising material it is however possible to unravel important issues. This article deals with Themistius’ and Alexander’s exegeses of the meaning of the key terms “generated” and “ungenerated” and argues that Themistius attests the classification made by Alexander, but in his own exegesis endorses the typical Neoplatonic distinction between “generated” as “temporally generated”, on the one hand, and “generated” as “having a cause of its coming into being”, on the other. A six-page Prologue introduces the commentary on Aristotle’s De Caelo written by Simplicius after 529 AD. As usual in the exegeses typical of the Neoplatonic schools of late Antiquity, this Prologue addresses a series of preliminary questions that are meant to steer the interpretation in its entirety, as well as to frame the text to be commented upon within the reading canon of the Aristotelian works, which were intended to provide the propaedeutics to the reading canon of Plato’s dialogues. Simplicius addresses the question of the scope of De Caelo, discussing the interpretations advanced by Alexander of Aphrodisias, Iamblichus, and Syrianus. According to Alexander, this treatise deals with the universe as a whole, as well as with the five simple bodies contained in it. It was with Iamblichus, who advocated the idea that for each Platonic dialogue there was only one σκοπός, that the unity of a philosophical work was raised to the rank of a general rule. According to Iamblichus, the σκοπός of the De Caelo is the divine body of heaven. As a consequence, the primary elements that depend upon the heavens are included in the treatise. Syrianus deepens the theological tendency implied in Iamblichus’ interpretation: for him, the σκοπός of the De Caelo is primarily the divine body of heaven, and only secondarily the set of sublunar elements. Simplicius treasures the commentary by Alexander; nevertheless, he questions the σκοπός assigned by him: Alexander underestimated the importance of the unity of the treatise, even though his intention to account for each and every question raised by Aristotle was laudable. Contrarily, Syrianus was right in emphasizing the theological vein of the De Caelo, but focussed only on the section on the divine body of heaven, playing down books III and IV as if they were only ancillary, thus forgetting that the σκοπός must account for the whole of the treatise at hand. Between the two positions, Simplicius advocates the idea of a synthetical σκοπός, following in the footsteps of Iamblichus’ interpretation, but taking systematically into account the best of Alexander’s. The σκοπός of the De Caelo is the divine heaven, that “communicates” its perfections to the entire universe. Simplicius’ position is revealed to be very different with respect to that of other commentators like Ammonius and Philoponus, who both considered that the title was self-evident and required no special investigation. The aim of this paper is to provide the edition, with translation and commentary, of a short Syriac epistle by Severus Sebokht, bishop of Qenneshre (7th century), in which the author discusses some issues related to Aristotle’s Peri Hermeneias and Analytics. The commentary examines in detail Severus’ Syriac text by comparison with the Greek sources, namely the commentaries by Alexander of Aphrodisias, Ammonius, and Philoponus. In addition, in an appendix a study is included of a part of another epistle by Severus, concerning the existence of the possible, which shows a remarkable similarity with Alexander’s Question II 4. This contribution presents the text and translation of an unpublished part of the Syriac Treatise on the Astrolabe by Severus Sebokht recently found in a manuscript of Mardin (Turkey). This supplement to the text contains an astronomical exercise applied to the year 523 AD. Thanks to this date and to a detailed analysis of the structure of the text, we are now able to date the Greek treatise used by Severus Sebokht, and to specify how this 7th century Syriac scholar integrated it into his composition. Unfortunately, the name of the Greek author is never given in our document; nevertheless a combination of external information points to Ammonius of Alexandria as to its author. The Syriac author Iwānnīs of Dārā (first half of the 9th century), in his still unpublished Treatise on the Soul, employed a pseudo-Platonic treatise On the Subsistence of Soul’s Virtues among his sources: a treatise whose text is lost in Greek, but is preserved in an Arabic version. A comparison of the Arabic version with the Syriac quotations found in Iwānnīs of Dārā’s work strongly suggests that the former depends upon a lost Syriac complete version, from which the latter was taken, too. The Syriac version also influenced some passages of Severus bar Šakkō’s Book of Dialogues, so showing the diffusion of this text by this way in Near East till to 1240. Moreover, there is a still unknown influence of it upon a passage of a work by a Judaeo-Arabic author, a contemporary and compatriot of Iwānnīs of Dārā: Dawūd al-Muqammiṣ’s Twenty Chapters, where the same Syriac text found in Iwānnīs of Dārā’s own work seems to have been used as a source. This passage of Dawūd al-Muqammiṣ’s work might have influenced even a passage of Aḥmad ibn Miskawayh’s Correction of Morals. In the Appendix, the Syriac terminology of some important passages of Iwānnīs of Dārā’s work are compared with the terminology found in the corresponding passages of some Patristic Greek and Arabic texts. In this paper some notes on the text tradition of Book I and Book III of Proclus’ Commentary on Plato’s Timaeus are offered, on the basis of new palaeographical studies of the manuscripts Marc. gr. 194, Par. Coisl. 322, Chis. R VIII 58, and on that of the new finding of a paper scroll containing long sections of Book III in Patmos, Monastery of St. John the Theologian. As for Book I, I will show that the manuscripts Marc. gr. 194 (until p. 130.24 Diehl) and Chis. R VIII 58 (from p. 130.24 Diehl) are new primary witnesses, and that the manuscript Par. Coisl. 322 (dated 13th-14th cent.) deserves more attention for the ancient transmission of the text. As for Book III, I will show that the oldest extant source is now the Patmos scroll, near to Marc. gr.195, also for the extant scholia, and presumably to the exemplar belonging to the “Philosophical Collection”. Submitted to the conference “Die Blüte der arabischen Philosophie und ihre Früchte in Europa. Festkolloquium zum 75. Geburtstag von Gerhard Endreß” organized by Jörn Thielmann and Cleophea Ferrari in Bochum, November 26-27, 2014, this paper deals with Plotinus’ arguments against total blending (κρᾶσις δι’ ὅλων) and their reception in the formative period of Arabic philosophy. Actual dissection of a body by a body to infinity proves to be impossible: hence, only an incorporeal reality – the soul – can be omnipresent in the body. This Plotinian topic, reminiscent of the interschool polemics of the Imperial age, was transmitted to the Arabic-speaking philosophers through the adapted version of Ennead IV 7. The aim of this article is to present and put into context a curious little treatise preserved in a Tehran manuscript with the intriguing title Nawādir min Kalām al-Falāsifa al-Muwaḥḥidīn wa-l-aʿlām al-māḍiyīn, The Most Precious Words of the Philosophers Professing the Oneness of God and of the Authorities of the Past. The treatise contains a collection of sayings of the ancient Greeks like Hermes, Pythagoras and Plato and of the Alexandrians related to the central doctrine of Islam, the oneness of God (tawḥīd). The material recalls the first Christian apologies addressing the pagans in an attempt to win them over to the new religion by demonstrating that already their authorities of the past had believed in only one god. The treatise is, however, strikingly different from other Arabic texts which link Greek philosophers to the tawḥīd as I want to show by excerpts from Christian apologies and the philosophical tradition of al-Kindī. Muḥammad b. Zakariyāʾ al-Rāzī, a major contributor to the Galenic tradition in medicine, pursued philosophy as well, as Galen had urged physicians to do. Rāzī believes in critical thinking and intellectual progress. He rejects the authority of prophets: They are, at best, impostors, and the exclusivity of claims to revelation breeds bloodshed rather than salvation. God enlightens us, Rāzī argues, through the gift of reason, not the visions of a few: All of us are capable, if we put our minds to it, of thinking for ourselves, well enough in fact for the soul to make her way back to her true home. Creation, Rāzī argues, resulted from the over-ebullience of a soul too eager for embodiment, too spontaneous to control herself without the gift of reason, and too innocent to foresee that her sufferings would inevitably outweigh the peaceful pleasures she would seek in the world her vivacity sets in motion. Rāzī’s world did begin. But matter, time, space, and soul, as well as God, are eternal. Space and time, pace Aristotle, are absolute. Atoms are uncreated and indestructible. Rāzī hoped for immortality but had no truck with the tales of physical resurrection. He grounds his ethics chiefly on prudential counsels: The appetites are self-enlarging; the passions, self-aggravating and inevitably frustrate. Pleasures, rightly understood, result from the relief of pain or other dislocation. Their optimum is found not in ever more intense sensation but in the respite that awaits us when we rein in desire. The present paper explores the roots of Rāzī’s ethics and cosmology, seeking to understand his affinities with Epicurus and other predecessors including Plato – with Galen frequently the mediator. Rāzī learns from Galen much of what he knows of philosophy. But independence of mind is his most striking philosophical attribute. The notion of ὑπόκρισις (hypokrisis) was employed for the first time with the meaning of “rhetorical delivery” in Aristotle’s Rhetoric, where it is the target of a short and highly critical analysis. A practice borrowed directly from the theatre, and apparently resistant to any form of technicisation that might give it a legitimate place alongside the other means of rhetorical persuasion, ὑπόκρισις (hypokrisis) was nevertheless extremely effective–as Aristotle acknowledged with undisguised irritation. In the face of Aristotle’s ambivalence, and torn between a purist and idealist conception of rhetoric on the one hand, and the contemporary reality of speech, which required him to recognise a practice of which he could not approve, on the other, what was Averroes’ attitude in his Middle Commentary on the Rhetoric? Dependent on the Arabic version of the Rhetoric where the term ὑπόκρισις (hypokrisis) was – with one exception – translated by the expression أخذ بالوجوه (aḫḏ bi-l-wuǧūh) – “the taking of faces” –, has Averroes followed Aristotle in his hesitations and reticences? Or has he instead chosen to legitimise the use of hypokrisis in rhetorical technique? The analysis of the Rushdian interpretation of the ‘taking of faces’ will allow a better understanding of Averroes’ exegetical method, and grasp of what it meant, to him, to be faithful to the First Master. This article analyzes the references to Pythagoras, Empedocles, Socrates, Plato, Aristotle, and Diogenes in the works of the Šī‘i philosophers of Safavid Iran Mīr Dāmād, Mullā Ṣadrā, and Quṭb al-Dīn Aškevarī. Despite their lacunar knowledge of the aforementioned philosophers, these Persian thinkers saw ancient philosophy – labelled “wisdom” (ḥikma) – both as a speech of truth and as a way of life, a position that is at times reminiscent of Pierre Hadot’s approach to ancient philosophy as a whole. This “wisdom” was part and parcel of their own philosophical project. In their eyes the representation of Greek wisdom is grounded on a historiography connecting the Greek sages to the “niche of the prophetic lights” (miškāt anwār al-nubuwwa). This representation includes, in its theoretical dimension, a pedagogy, a theology, an onto-cosmology, a psychology, and an eschatology. In its practical dimension, it conjugates asceticism with a position of compromise with intra-mundane life. On all these topics, the Šī‘i philosophers try to conciliate the views of the Greek philosophers with the ḥadīṯs of the Imāms. Classical Greek is known for its abundant use of particles and connectives for organising the textual discourse. In Arabic, on the other hand, such markers are much less frequent, which causes problems in translating from Greek into Arabic. The aim of this study is to examine the transfer of Greek particles into Classical Arabic texts. 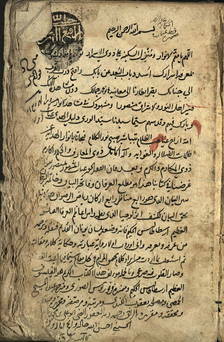 The material consists of short text samples from the Physics by Aristotle and the Elements by Euclid, both of which were translated by the well-established translator Isḥāq ibn Ḥunayn. The translator seems to have followed a consistent regime of strategies, with the general aim to translate as closely and accurately as possible, while avoiding direct borrowing from Greek. The taxis of the source text was used as a model for the target text, which is characterised by its syntactic iconicity in relation to the source text. It is suggested that a special generic style became established for expressing a scholarly identity of mixed Greek and Arabic origin, different from other stylistic developments of literature within the Arabo-Islamic space. The project Glossarium Graeco-Arabicum connects the study of writing systems with the field of information science, utilizing the Unicode standard. This paper points out particular historical developments both in philology and informatics that help to develop a modern approach to working in digital poly-alphabetical environments, based on interdisciplinary expertise. A description of how Unicode was implemented to represent ancient Greek and classical Arabic is followed by a historical outline of computer writing systems. Essential aspects are letter collationing, writing directions and user interfaces. The conclusion emphasizes the importance of a bilateral understanding of historical and technical disciplines.